Effective and professional communication is what makes your business flourish.Building on technological innovation and years of experience as market leading global company,Ricoh provides unequalled quality solutions tailored to the needs of more demanding businesses. 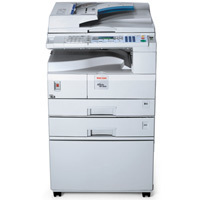 Boasting outstanding paper handling,this Ricoh MFP device is set to swiftly take care of your everyday tasks and answer your growing office demands. With the optional internal controller,these compact solutions can easily be transformed into fullblown multifunctionals with user friendly print and scan capabilities and even a professional fax.A perfect fit for today's complex network environments,they feature a large variety of digital distribution possibilities.Simply the smart choice for your growing business requirements! For more information on the Ricoh Aficio MP2550BAD please do not hesitate to call our helpful sales team on 0800 1244 199 or email us.